Today I'd like to share another page of my artist journal, my Book of Days. I like to go back in time and look at past pages with new eyes, after many months, to see what wisdom they might hold for me today, what memories and feelings they now evoke (you'll find the other pages I've shared so far HERE). Earlier this month we went on holiday to Ireland, one of my favorite places in the world. My husband William and I actually met there as Erasmus students and lived there for 2 years! The page I'm sharing today was created during our previous stay there, in the Spring of 2017. This year's trip was all about exploring and enjoying the place, seeing it with new eyes (the heat made it quite a different experience from what we remembered! ), while last year's was more about reconnecting after over 15 years without setting foot in Fairy Land. There was definitely a feeling of coming Home. Flying home. Reconnecting to something deep and magical that's part of our story, our roots as a family. 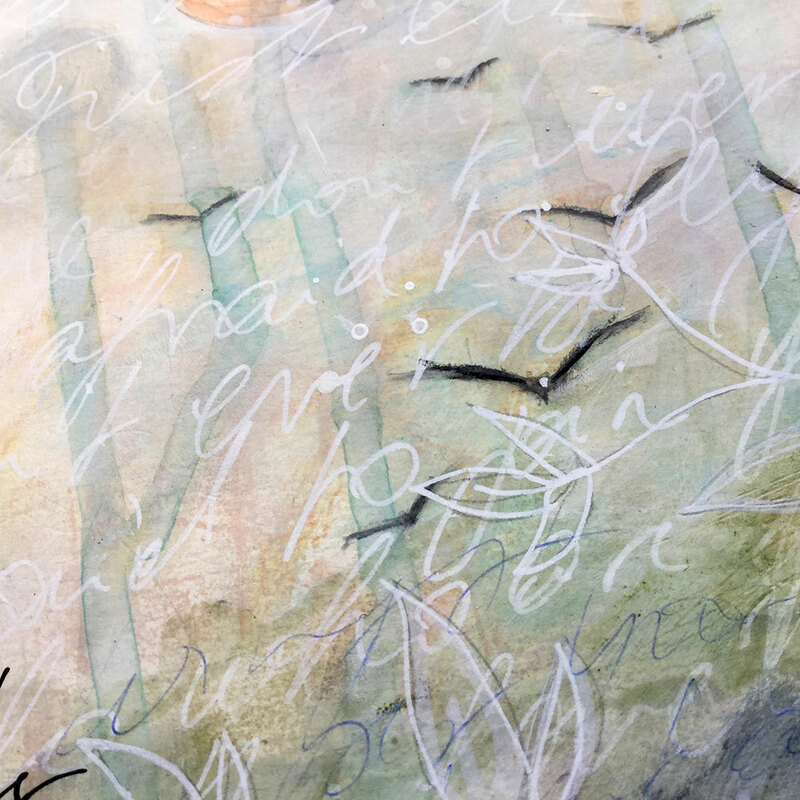 So it seems fitting that a fairy appeared on the page... She's gently holding a shy little birdie in the palm of her hand, nudging her to take flight and join her brothers and sisters who are joyfully rising together, celebrating their freedom in a candy-colored sky. She may be shy but she's wearing a crown, and I think that means she's about to open her wings, step into her own power and joyfully embrace who she truly is. This page speaks to me of Trust, of Joy, of Freedom, of Magic, of being Brave and allowing ourselves to feel Safe and Supported. Knowing that all is well and that sometimes, all we have to do is allow ourselves to enjoy it and celebrate! Another thing about this page is that I created it with very limited supplies. I love to take my journal with me while traveling, together with a small "travel kit" with just the essentials. Here I used water-soluble pastels instead of paints, and a magazine bought at the airport for collage materials! I love how having limited options is an opportunity to shake things up and renew inspiration! Plus the bedroom in our rented home had a lovely bow window that instantly turned into the perfect little creative nook, flooded with natural light even on a rainy day! I have my journal next to me as I type, and revisiting this page feels so good. I love the way it reminds me to embrace joy and to trust my wings, today and everyday. Connecting to the feeling of Home inside of me even when I'm away from "home". How do you connect to your creative muse when you are travelling? Do you maybe like to write? Sketch? Gather materials on your walks to take home? (that's what I did this year, I brought back lots of driftwood and pebbles from the lakeshore). 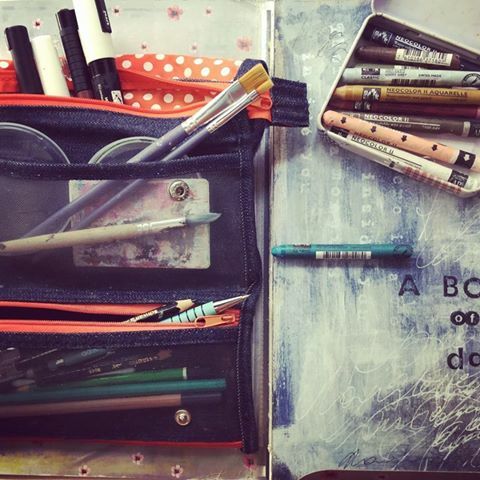 If you have an art journal, do you take it with you? Maybe a smaller one? What supplies do you like to carry? 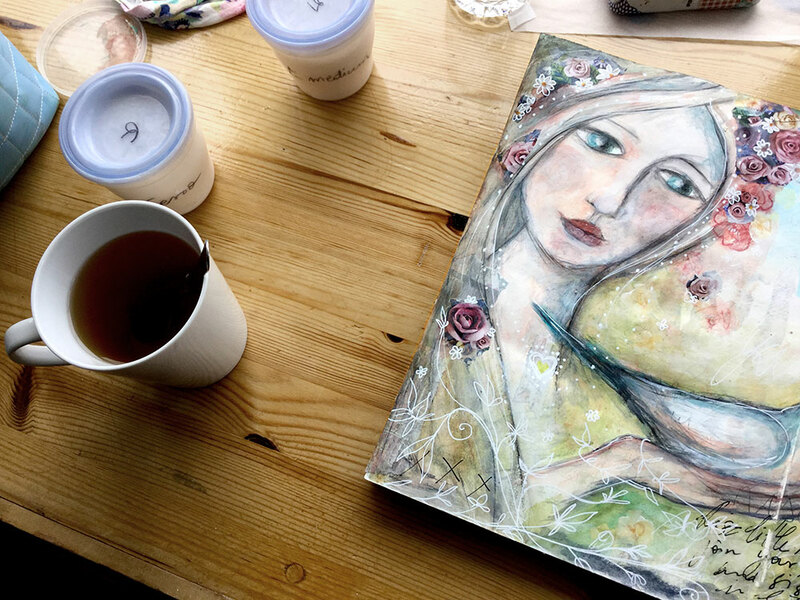 "The Artist & the Journal"
how I use my art journal as a source of inspiration for painting on canvas, exploring challenges and being braver in my art. NB: This much-loved class sold out really fast last time I offered it. You can put your name on the wait list HERE to be notified as soon as we open the doors. Thank you joining me here on my blog. Sharing my art, thoughts and feelings in this safe space is a very meaningful part of my journey as an artist, thanks to YOU. wishing you a joyful, light-filled week! 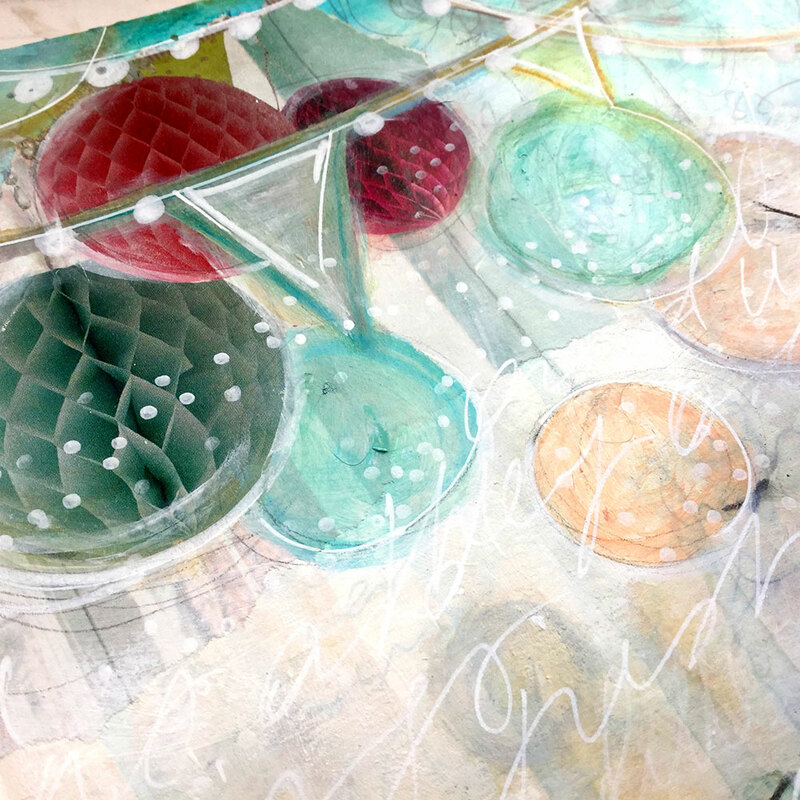 PS: I regularly share the pages of my art journal here on my blog . If you'd like to be notified of future posts by email, please subscribe to my newsletter list. Thank you! Older PostWoven Dreams: a new class!